The Arizona legislature has retained and expanded some of the incentives for charitable giving for 2018. This alert explains the credits for individuals only. The dollar limits differ depending on marital status. Your payments will make a positive impact on the recipient organization, while at the same time reducing your Arizona income tax liability dollar for dollar. The tax credit for contributions to a School Tuition Organization is $1,110 for “married filing joint” and $555 for all other taxpayers. The credit is available for a contribution that provides scholarships or grants to qualified elementary and high schools. Your contribution cannot be designated for the direct benefit of your dependent, but can be made to benefit a relative or any other student if they are not your dependent. Before making your contribution, make sure that the organization meets the rules set out by the Arizona Department of Revenue to qualify as a School Tuition Organization. The organization should give you a receipt showing the name and address of the school tuition organization, your name, the amount paid, and the date paid. The Private Learning Uplifting Students (PLUS) tax credit allows donors to receive credit for a contribution over and above the original tax credit. 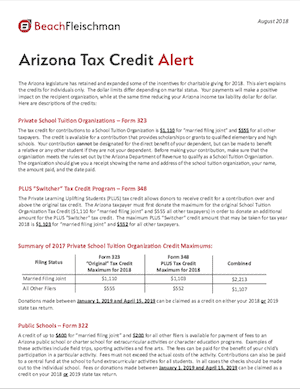 The Arizona taxpayer must first donate the maximum for the original School Tuition Organization Tax Credit ($1,110 for “married filing joint” and $555 all other taxpayers) in order to donate an additional amount for the PLUS “Switcher” tax credit. The maximum PLUS “Switcher” credit amount that may be taken for tax year 2018 is $1,103 for “married filing joint” and $552 for all other taxpayers. Donations made between January 1, 2019 and April 15, 2019 can be claimed as a credit on either your 2018 or 2019 state tax return. A credit of up to $400 for “married filing joint” and $200 for all other filers is available for payment of fees to an Arizona public school or charter school for extracurricular activities or character education programs. Examples of these activities include field trips, sporting activities and fine arts. The fees can be paid for the benefit of your child’s participation in a particular activity. Fees must not exceed the actual costs of the activity. Contributions can also be paid to a central fund at the school to fund extracurricular activities for all students. In all cases the checks should be made out to the individual school. Fees or donations made between January 1, 2019 and April 15, 2019 can be claimed as a credit on your 2018 or2019 state tax return. A credit of up to $800 for those filing as “married filing joint” and up to $400 for all other filers is available for cash contributions to a qualifying charitable organization (QCO). This includes those groups that provide services to chronically ill or disabled children. Taxpayers do not have to itemize deductions to claim a credit for contributions to charities that provide assistance to the working poor. Many well-known organizations assist the working poor and qualify for this deduction. A credit of up to $1,000 for those filing as “married filing joint” and up to $500 for all other filers is available for cash contributions to a qualifying foster care organization (QFCO). A contribution to a QFCO does not qualify for, and cannot be included in, a credit claimed as a contribution to a QCO on Form 321. Contributions made to an eligible QCO and/or QFCO between January 1, 2019 and April 15, 2019 may be claimed as a credit on either your 2018 or 2019 tax return. A credit for contributions of up to $400 for “married filing joint” and $200 for all other filers is available for contributions made to the Arizona Military Family Relief Fund (MFRF). The MFRF provides financial assistance for active duty service members, pre-9/11 and post-9/11 veterans and their families. Financial assistance is made available to assist with hardships caused by and related to combat zone deployment. Before you can claim this credit you must have received a receipt from the Arizona Department of Veterans’ Services that indicates the contribution qualifies for the credit. An S corporation that qualifies for corporate private school tuition credit may elect to pass through the credits to its individual shareholders. An S corporation that elected to do so would claim the approved corporate private school tuition tax credits on AZ Form 335 and/or 341. The corporation must obtain a copy of the school tuition organization’s preapproved application and file it with its tax return. The S corporation must provide its shareholders with AZ Form 335-S and/or 341-S. The shareholders then use AZ Form 335-I and/or 341-I to claim the credits on their personal tax returns. These credits may be claimed in addition to the two individual private school tuition credits and are not subject to limitations that apply to the individual private school tuition credits. The credits described above give you the opportunity to direct your tax dollars to the schools and charities of your choice at no cost. The state credits totaling $4,813 for “married filing joint” and $2,407 for all other filers can be claimed at one time for contributions made individually. With the exception of the Arizona Military Family Relief Fund Credit, unused credits will be carried forward for five succeeding years until used. Depending on your individual situation, you may also be able to deduct the contributions on your federal tax return. Receipts should be retained for your records and provided to your tax preparer so they can account for it on your Arizona tax return. Contributions and fees paid by April 15, 2019 (except the Arizona Military Relief Fund and the S Corp. Private School Tuition Credits which must be paid on or before December 31, 2018) may be claimed on your 2018 income tax return. Under proposed federal tax regulations issued on August 23, 2018, you will only receive a federal charitable contribution deduction for these tax credit contributions if they are made on or before August 27, 2018. If you would like to know more about these credits or find out how they would apply to your specific tax situation for 2018, please contact us using the form below.